The Italian verb for peel is the irregular -ARE verb sbucciare. ... imagine the S BUTCHER peels prawns! Sbucciare can also mean: to shell, to skin, to blanch/parboil. - sbucciarsi (vr) : to graze or skin or scrape oneself. - la sbucciatura (nf) : peeling; scrape or graze. - il sbucciatore (nm) : peeler (manual). - il sbucciapatata (nm) : potato peeler. These verbs remove an i in some conjugations. Verbs conjugated in this way also include : agganciare, arricciare, bilanciare, enunciare, falciare, pronunciare, scacciare, annunciare, marciare, sbucciare. 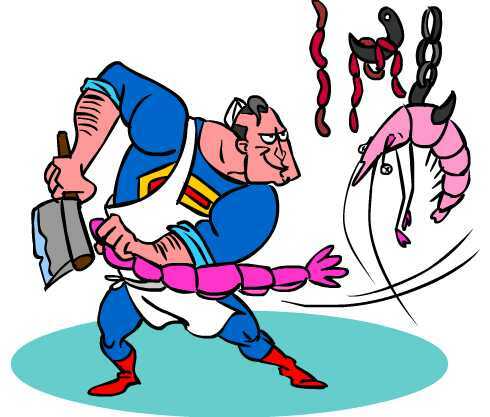 Imagine the S BUTCHER peels prawns! non sbucciare (non) sbucci! (non) sbucciamo! (non) sbucciate! (non) sbuccino! ✔ Sbucciare is an irregular -ARE verb, these being the most common verbs in Italian. ✔ Learn sbucciare and it will reinforce the pattern for ALL those other -ARE verbs. ✔ You can more easily remember words and verbs like the Italian for peel - sbucciare using the techniques of the world's Memory Masters. 200 Words a Day! Free Daily Italian Lesson Online - the verb in Italian for peel is sbucciare - fully conjugated. Italian Learning Made Fun and Fast with your free Daily Italian Verb Lesson - sbucciare.